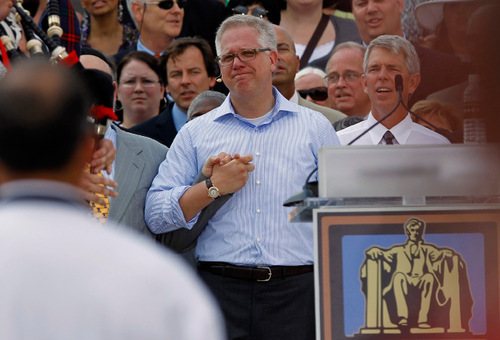 Glenn Beck leads, but will evangelicals follow? New coalition • Mormon talk-show host winning some converts of his own. 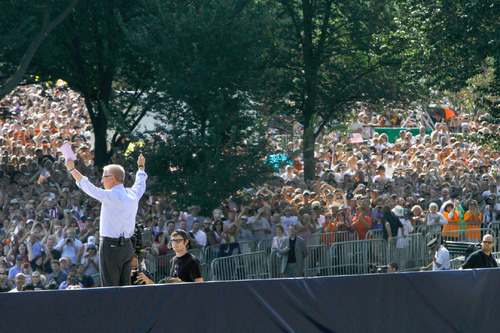 Glenn Beck waves to the crowd at the start of the "Restoring Honor" rally, in Washington, on Saturday, Aug. 28, 2010. (AP Photo/Ja Glenn Beck, center, holds hands with faith leaders at the "Restoring Honor" rally in front of the Lincoln Memorial in Washington S Glenn Beck bows his head in prayer during the "Restoring Honor" rally in front of the Lincoln Memorial in Washington, Saturday, Au Glenn Beck waves as he arrives to speak at his "Restoring Honor" rally in front of the Lincoln Memorial in Washington in August. 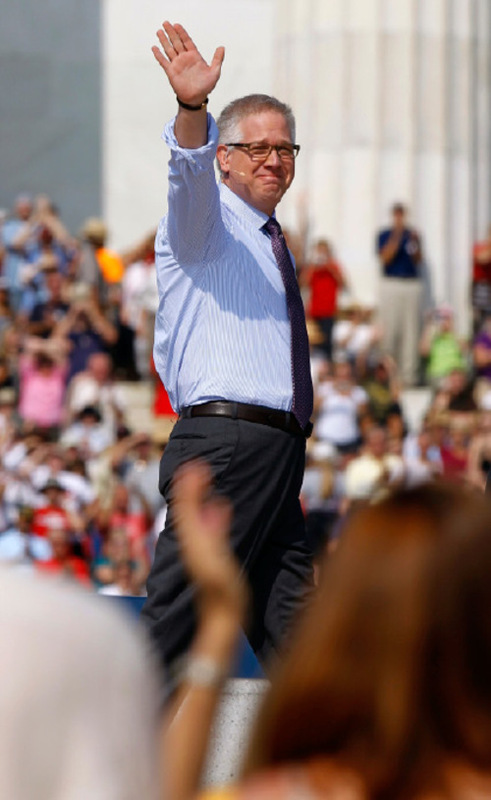 Glenn Beck waves to the crowd at the start of the "Restoring Honor" rally, in Washington, on Saturday, Aug. 28, 2010. (AP Photo/Jacquelyn Martin) Glenn Beck, center, holds hands with faith leaders at the "Restoring Honor" rally in front of the Lincoln Memorial in Washington Saturday, Aug. 28, 2010. 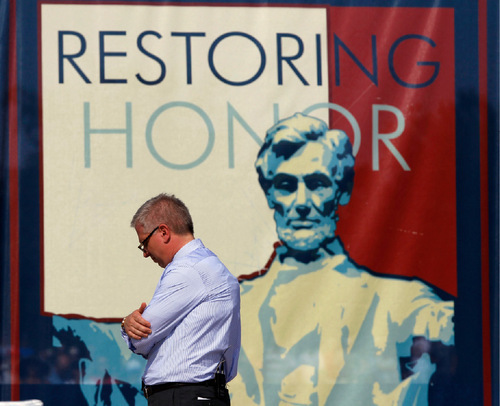 (AP Photo/Alex Brandon) Glenn Beck bows his head in prayer during the "Restoring Honor" rally in front of the Lincoln Memorial in Washington, Saturday, Aug. 28, 2010. (AP Photo/Alex Brandon) Glenn Beck waves as he arrives to speak at his "Restoring Honor" rally in front of the Lincoln Memorial in Washington in August. Beck may exit the Fox News Channel at the end of the year and has contemplated a partial or wholesale takeover of a cable channel. Associated Press file photo. Washington • Southern Baptist executive Richard Land was pleased at how religious Glenn Beck's "Restoring Honor" rally turned out to be. Bishop Harry Jackson, a black evangelical leader, was pleasantly surprised that the Fox News talk show host and Mormon convert said things "some of my close friends could have written." And Liberty University President Jerry Falwell Jr. was among the faith leaders to enlist in Beck's new "Black Robe Regiment." In the wake of the conservative commentator's rally on the National Mall last weekend, some evangelical leaders say he sounded all the right religious notes. But others say Beck's LDS faith clouds the message. "Glenn Beck's Mormon faith is irrelevant," Falwell said. "People of all faiths, all races and all creeds spoke and attended the event. Nobody was there to endorse anyone else's faith, but we were all there to honor our armed forces and to call the people of America to restore honor." But other conservative Christians say Beck's leadership at an event attended by evangelicals and other conservatives was nothing short of scandalous. "The answer to this scandal ... includes local churches that preach the gospel of Jesus Christ and disciple their congregations to know the difference between the kingdom of God and the latest political whim," Russell Moore, dean of the School of Theology at Southern Baptist Theological Seminary, wrote on his blog the day after the rally. "It's sad to see so many Christians confusing Mormon politics or American nationalism with the gospel of Jesus Christ." At the rally, Beck paced before the Lincoln Memorial as he described the "240 men and women" from a range of faiths who had joined his regiment. "We can disagree on politics," Beck said. "These men and women here don't agree on fundamentals. They don't agree on everything that every church teaches. What they do agree on is God is the answer." There is no doubt that Beck has a following. Gallup has ranked him as the fourth most admired man  just ahead of Pope Benedict XVI  and millions tune in to his daily broadcasts. But, as his religious rhetoric attests, Beck has gone fishing for a new audience recently. Weeks before the rally, he gathered about 20 prominent religious leaders for a dinner at which, according to Land, he said God was leading him to talk about revival in America. The night before the rally, he held a "Divine Destiny" event that promised to leave participants with a "strong belief that faith can play an essential role in reuniting the country." That kind of language has some evangelicals upset. "Beck used his conservative veneer and double-speak to co-opt leaders of the religious right," wrote Brannon Howse, founder of Worldview Weekend, which sponsors Christian worldview conferences. Others, such as Lou Engle, founder of The Call rallies across the country, said Beck will get qualified support. "Evangelicals will see him as a moral voice," Engle said, "not necessarily a spiritual voice." Experts say Beck's ability to reach evangelicals will depend on whether he speaks a broad message or delves more narrowly into his LDS beliefs. "Most evangelicals are friendly toward the idea of American civil religion and I think Beck's call sort of fit into that stream of history," said Stan Guthrie, editor at large for Christianity Today. "As long as he doesn't get too specific about his Mormon faith ... many people will be willing to get on board." Added evangelical public-relations executive Mark DeMoss, who advised Mormon Mitt Romney's 2008 presidential campaign: "If he were mobilizing some sort of theological movement, I think most evangelicals would not get behind it, but I don't sense that that's what he's doing." In 2007, more than a third of Republican white evangelical Protestants said they would be reluctant to vote for a Mormon for president, and 39 percent of white evangelical Protestants viewed Mormons unfavorably, according to a poll conducted by the nonpartisan Pew Research Center. John Green, an expert on religion and politics at the University of Akron, said doctrinal differences between evangelicals and Mormons historically have made it difficult for them to form alliances. Some prominent evangelicals have distanced themselves in the past from Beck because of his Mormonism. In 2008, Focus on the Family founder James Dobson abruptly pulled an interview with Beck after viewers voiced concern about "theological compromise." Green said much of the squeamishness is due to the additional sacred scripture and tenets that Mormons revere along with the Bible. But despite those differences, he said there has been a growing sense of pragmatism among religious leaders who have worked together. For example, evangelical leaders defended the Utah-based LDS Church when gay activists criticized it during the contentious debate over gay marriage in California. Randall Balmer, professor of religious history at Barnard College in New York, said Beck may be showing Romney a "better way to the heart of evangelicals" by being more forthright about his Mormon faith. He even speculated that perhaps Beck is a "stalking horse for Mitt Romney in 2012." Whether Beck has such political aspirations, Balmer said, his efforts to draw evangelical attention could end up creating exactly what Falwell's father envisioned  a powerful coalition of politically conservative evangelicals, Catholics and Mormons. "If Beck truly emerges as a leader for that movement, he will have fulfilled Jerry Falwell's dream," Balmer said. "Beck is working awfully hard to ingratiate himself to that population."